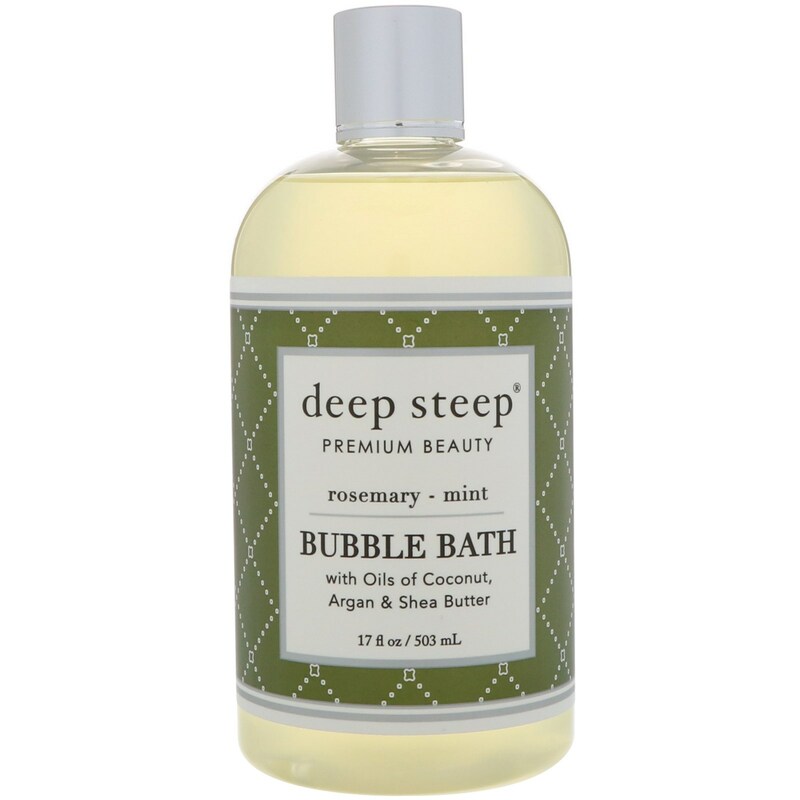 Deep Steep's Rosemary Mint Bubble Bath calms and relaxes you while you bathe. This decadent, fragrant bath, enriched with nourishing oils of Argan, Coconut and Shea Butter, leaves your skin feeling soft, smooth and delicately scented. 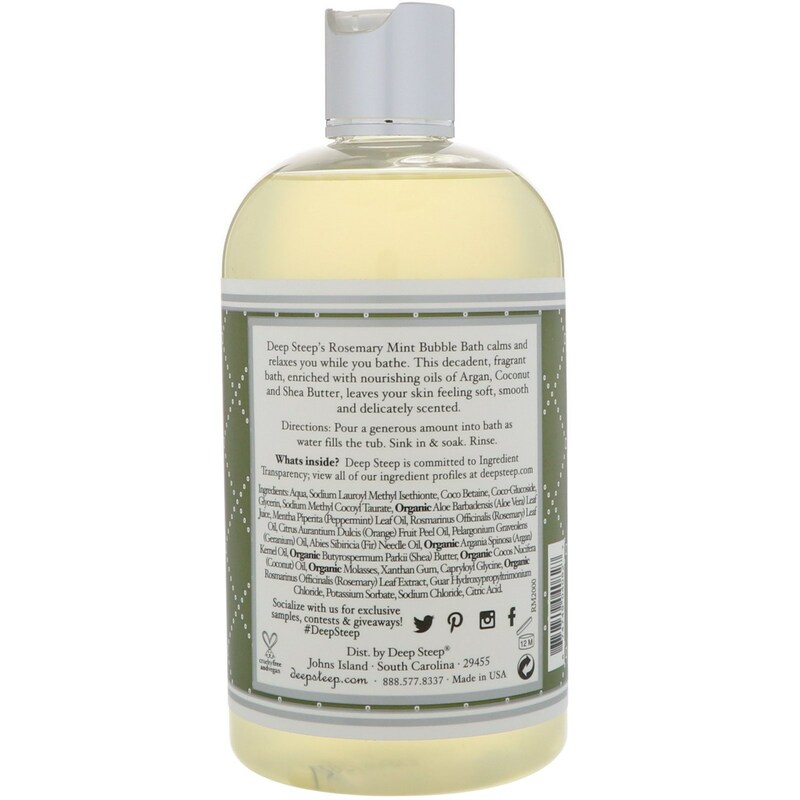 Aqua, sodium lauroyl methyl isethionte, coco betaine, coco-glucoside, glycerin, sodium methyl cocoyl taurate, organic aloe barbadensis (aloe vera) leaf juice, mentha piperita (peppermint) leaf oil, rosmarinus officinalis (rosemary) leaf oil, citrus aurantium dulcis (orange) fruit peel oil, pelargonium graveolens (geranium) oil, abies sibiricia (fir) needle oil, organic argania spinosa (argan) kernel oil, organic butyrospermum parkii (shea) butter, organic cocos nucifera (coconut) oil, organic molases, xanthan gum, capryloyl glycine, organic rosmarinus officinalis (rosemary) leaf extract, guar hydroxypropyltrimonium chloride, potassium sorbate, sodium chloride, citric acid.